GAS-RX™ is the all-season hi-tech treatment and conditioner that eliminates the harmful effects of water contamination in all 2 and 4 cycle engines! Engine Deposits – Corrosion – Catalytic Converter Failures, etc from this source. due to phase separation. GAS-RX™ is an organic based, powerful fuel system stabilizer and cleaner, that helps prevent E-10 fuel Phase Separation. 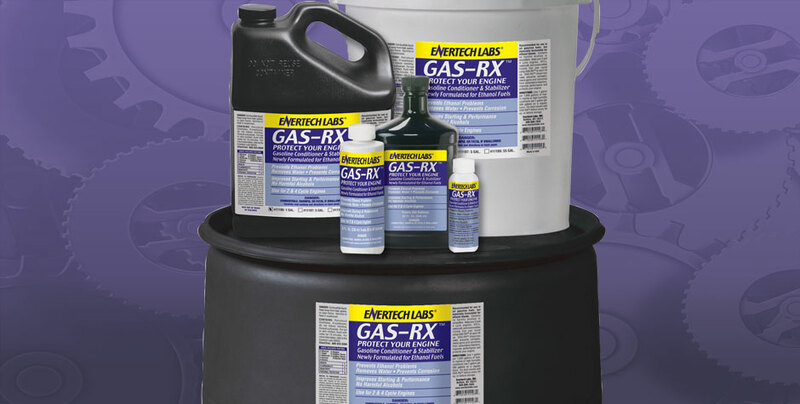 GAS-RX™ improves fuel efficiency, increases power, reduces emissions, and reduces engine wear. This powerful multi-purpose formula dissolves gum, varnish, and carbon deposits that distort fuel injector spray patterns and damage delicate injector and pump components. GAS-RX™ contains no harmful alcohols or emulsifiers and allows your engine to operate with all the power and efficiency it was designed to. Ron, I am sending a short note of thanks for your help with the phase separated underground storage tank. The 20,000 gallons of ethanol gasoline was able to be used properly after a treatment of Gas RX from Enertech Labs. We removed the water from the bottom of the tank, treated with Gas Rx to remove the dissolved water and the problem was solved. All pumps worked properly and there were no complaints received from customers at all. Your product saved us time and money. Thank you for your help and great product. A routine bottom sample of the underground fuel storage tanks for Sweet Home schools uncovered phase separated Gasoline. The electronic water indicator showed very small amounts of water. When tested Enertech Labs found 2.5 inches of water. The water from the bottom of the tank was pumped and upon a second inspection Enertech Labs found that ¾ inch of water still remained. Enertech Labs returned a third time, to the school while the pump company was on site to make sure that the tanks were properly cleaned. This fuel tank was cleaned, treated with Gas Rx and restored back to full capacity. experienced phase separation of the Gasoline fuel tanks. This one location alone resulted in the breakdown of 18 trucks and more than $25k in vehicle repairs. The fuel companies recommend that all the fuel in the bulk tank be discarded and replaced at the DOT’s expense. Our team sampled 10 fuel sites throughout the WNY region to find 60% of the fuel tanks, gasoline and Diesel, needed remediation. All of the tanks were cleaned, treated with Gas Rx and restored back to full capacity without discarding or wasting any fuel. NYSDOT experienced diesel engine injector failure, Enertech Labs products brought in manufacturer representatives to analyze the failure. NYSDOT was able to determine the root cause of the problem and take corrective measures. The result was to minimize the expense by changing internal procedures. My 2009 KIA Sportage doesn’t run well on Ethanol Gas. My car sat in my driveway for weeks because it ran rough. I poured in Gas Rx and my car was running like new in 1 hour. Gas Rx was like magic for my car. I had a generator stored in my garage for over 3 years with the same old gas in it. When I finally got it running the engine was sputtering and finally stalled. I added Gas Rx to the tank and 20 minutes later it was running smooth. I have used Gas Rx in my mower, snowmobile, and lawn equipment and it has all of my equipment running better – Easier starting and smoother running engines. My brother in-law was going to throw away his string trimmer because it was not running. He put in Gas Rx and 20 min later it was running smooth. We use it in everything. We Put Gas RX to the test. A customer brought in a Craftsman 5.5 hp push mower that would not run. It would run and stall, run and stall. So we added Gas Rx to the tank and started it a few times before it started to run and sputter – 15 min. later it was running smooth. We sell Gas Rx to all of our customers. I have been cleaning fuel tanks and fixing phase separation with GasRx for over 4 years in the southeastern US. We carry a drum on every trip. We have reversed and stabilized thousands of gallons and saved our clients thousands of dollars. When we hear stories of distrbutors or retailers losing thousands of dollars transporting phase deprecated fuel we can’t believe the waste. Thanks Ron, your products continue to prove themselves. We had a tamper that was hard starting, stalling and would not stay running. After adding 2 oz. of Gas RX and a few starts the engine started to smooth out. Within 10 minutes that engine was running smooth and able to be put back to use. Gas Rx reversed the phase separated ethanol allowing the engine to run properly. We had a Briggs and Stratton Lawn Hedger that was running rough, and being scheduled to have the carburetor replaced. Instead, our branch treated with GasRX and ran it for a few minutes and it cleared the issue right up, and we were able to place the Hedger back out on rent. We had a Scissor Lift that came back from a customer who used bad fuel, and the lift was running rough, and hard starting. After treating with GasRX and letting it run for a few minutes, it cleared the problem, and the lift began to run smooth again. I used GasRX in my 1998 Jeep Cherokee that was running rough, and it smoothed out my engine, and I have since seen better gas mileage as well. I cleaned up a Honda engine in one of my augers that was running rough due to bad gas from a customer by using a 2oz shot of GasRX, by doing so, it saved me downtime, labor, and I was able to rent the equipment immediately. We poured 4oz of GasRX into my 2012 Jeep Cherokee that had the check engine light on for 3+ months. After doing so, I drove my vehicle for about 10 miles and the check engine light turned off, and has remained off. Our branch had a chainsaw that was running rough, and would not start. We treated it with GasRX and let it set for a few minutes, the chainsaw fired right up, and has been running smooth ever since. Our branch had a chainsaw that was running rough, and would not start. We then treated it with GasRX and let it set for about 10-15 minutes, the chainsaw fired right up, and has been running smooth ever since. We were working on a Subaru Robin Soft Cut that would only run on three-quarter choke. After treating with GasRX the machine ran properly, and we were able to place it back on rent the same day. I used GasRX in my lawn mower at home, a Craftsmen with a Briggs and Stratton engine, the mower has not run in over 6 years. After draining the old fuel, and using a 2oz bottle of GasRX and topping off with fresh fuel, the mower began to run again! It has been running smooth ever since. Our branch used GasRX in a 2012 F-150 because it was having emission troubles, and a check engine light was on. GasRX cleared the emission troubles, and the light has remained off ever since. We had an On Board Welder that was running rough, after treating with a half bottle of 8oz GasRX, it completely smoothed out and he does not have to run it on choke anymore. I have a Honda Ditch Switch that was running rough due to bad gas, so I treated with GasRX and it smoothed the engine right out, and I was able to place the piece right back out to rent. We had a pressure washer that would not run for 3 years. After clearing the lines, trying new gas, spraying WD-40 in the carb, and a few other tricks, the washer would still not run. However, after using a 2oz GasRX bottle, and letting it sit over a weekend, the Pressure Washer fired right up! Our branch loves the simplicity of the 2oz GasRX bottle and the retail appeal that it has. After trying it in a rough running lawn mower, and GasRX clearing the issue, we are consistent customers with Enertech Labs. A customer had a lawn mower that was surging, so he purchased a 2oz GasRX bottle, and after running the mower for 15 minutes it was smoothed out, and running properly. We used GasRX all winter, and we replaced fewer carburetors and spark plugs in the Spring, than ever before. GasRX helped us at our branch tremendously.